This Thanksgiving, choose kindness. Walle thanks you. Thanksgiving is a time of gratitude and reflection. It is a celebration of life and hope for a bright future. Yet the festivities center on a dead animal, a bird who was once a candidate as America's national bird, a bird who forms friendships and has a broad language of calls. Every year, more than 40 million turkeys are slaughtered for Thanksgiving alone, a holiday that is supposed to revere life, yet sadly doesn't. Walle was supposed to be one of the 40 million this year, shackled and slaughtered for Thanksgiving. She saved herself, walking off the "free-range" farm and wandering until someone picked her up. Someone who saw her as a sweet bird needing to be saved, not eaten. She had already suffered. The farmer had cut off apart of her beak and the first digit of her toes. Debeaking is common, because overcrowding creates an unnatural social structure, increasing aggression. Imagine being stuck in an elevator for five months with 10 strangers and you might see how fighting would be inevitable. Turkeys are de-toed to make grabbing them by the legs prior to slaughter easier for the handlers. Both are painful and cause lifelong discomfort to the birds. Amazingly, this mistreatment hasn't deterred Walle from being friendly with all walks of life, including humans. As she recovered from a respiratory infection, she loved visits from staff, reveling in any brief contact. Healthy, she greeted humans cheerfully with a sweet, child-like trill. Her favorite past-time is being scratched right below her chest - she leans into the touch, and helps by grooming her personal masseuse. Walle, like all white-breasted production turkeys, has been bred to grow fast and large. Domestic production turkeys cannot fly, unlike their wild counterparts. They cannot mate naturally and are all artificially inseminated. If humans children grew at the same rate as turkeys, they'd weigh 250 lbs by the age of two! All turkeys slaughtered for consumption are babies, killed at the young age of 4-6 months. That's only 5-7% of their natural lifespan! Turkeys are fascinating animals. 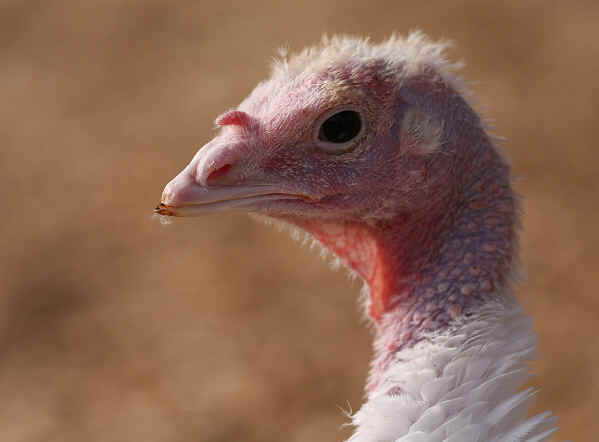 They have an actual language, can be trained similar to a dog, and form strong bonds with other turkeys and species. This Thanksgiving, please give the turkeys thanks by not eating them. It's that simple. There are plenty of alternatives, from commercial products to making your own. Examples include Tofurky, and Field Roast. When given a choice between unnecessary suffering and kindness, shouldn't our moral imperative be compassion? This Thanksgiving, choose kindness. Walle thanks you.